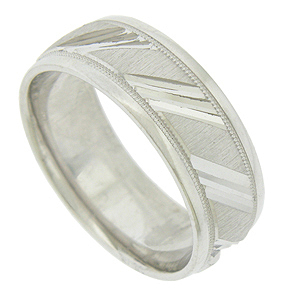 A brightly etched triple slash repeats across the satin finished central band of this handcrafted 14K white gold mens wedding band. Distinctive milgrain decoration and smoothly polished edges flank the central design on either side. The wedding ring measures 7.26 mm in width. Size 11. We cannot re-size, but we can reorder in other sizes. Also available in 18K, yellow gold, platinum and palladium. Cost will depend on current market value of the precious metal used.